What I didn’t realize is that after the city has celebrated La Conchita for 9 days, the festivities just shift to Guadalupe, the Mexican Virgen whose day is Dec. 12. It is a much more muted holiday in general in Nicaragua, but my house is quite close to the Guadalupe church which is the rocket launching site for all of the munitions dedicated to Juan Diego’s vision. It sounds like there is a firing squad operating 24 hours accompanied by a brass band. 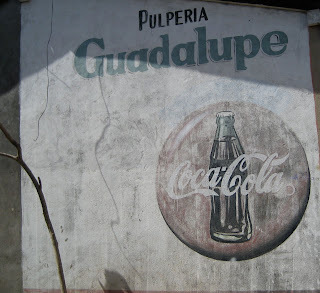 Guadalupe also has her followers, but she only makes two trips through town in the afternoon. Girls dress up in traditional Nicaraguan dresses and boys dress up like Juan Diego; they wear white Mexican peasant shirts and pants and draw charcoal beards on their faces. People carry baskets with offerings for the Virgen. They bring fruit, flowers, rice and beans, cleaning supplies and brooms. 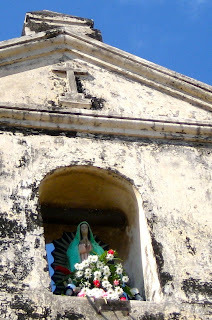 The offerings are piled around the Virgen and then distributed to old folks. Jorge takes his offering every year because his mother made a promise to Guadelupe 11 years ago when Jorge was ill as an infant. This year he refused to wear his San Diego suit because, as he says, he isn’t a kid anymore. Indeed it is true. He has to work with his uncles in the carpentry shop wh en he isn’t in school and I just saw him roaming around Calzada late the other night with his 16 year old cousin.